i b i k e l o n d o n: Next stop: mass cycling. Here comes London's Olympic legacy for cyclists! Next stop: mass cycling. Here comes London's Olympic legacy for cyclists! Boris Johnson is today announcing details of his new cycling strategy [Read the full PDF, here]. Outlining where an unprecedented £1billion of investment will be channeled over the next ten years, it is a bold and ambitious document. As ever, cyclists will be welcoming developments cautiously - even optimistically - but with a very keen eye on the detail. A comprehensive central London bike grid feature in the proposals, as does a "Cycling Crossrail" from West London all the way across the city to Canary Wharf in the east. Removing a lane of traffic from the Westway - the ultimate symbol of planning for cars writ large - the largely separated cycle track will allow people on bikes to soar over western suburbs congestion, before taking in the finest views of London from a cycle track between Big Ben and Blackfriars along the Embankment, before connecting with CS3 to Canary Wharf. A series of quieter routes mirroring existing Underground lines will allow cyclists to find their way in to central London more easily, where the use of filtered permeability, bike-only roads and separated cycle tracks will allow incoming cyclists to disperse safely, as well as make safe journeys in and around the centre of the city itself. This being Boris Johnson's proposal, there's plenty on the table for the outer boroughs too. Current "biking borough" funding will increase from a paltry £3M to more than £100M in a bid to create "mini-Hollands' in the suburbs, with high spending concentrated on one or two willing outer London boroughs for the greatest possible impact. As cycling levels are so low in the outer boroughs and there is so much potential for short car journeys to be really converted in to cycle trips if the conditions are right this is perhaps one of the most exciting parts of BJ's plan. Safety, of course, has not been left out. There's a clear and considered approach to the consistent problems posed by lorries in London, and TfL are pledging to do more on this serious issue. They'll be expanding the excellent work whereby safety features are fitted to lorries as a requirement specified within their procurement process (as pioneered by Crossrail where all scheme lorries have full crush guards, mirrors and sensors as a condition of being involved). Most excitingly, the Mayor is pledging that all future TfL cycle funding for the boroughs will be conditional on ensuring that their own fleets and contracted services adhere to best practice - effectively delivering the London Cycling Campaign's Safer Lorries campaign in one fell swoop. A fly-over of the proposals for the Embankment - doesn't this look like a nice place to ride? As ever, soft and squishy cyclists have the most to loose if poor designs are implemented, so cyclists, bike bloggers and campaigners will be keeping a very close eye on developments to ensure that Boris Johnson's cycling reality matches his colourful rhetoric. He is pitching these proposals as London's genuine, lasting Olympic legacy after those Games showed us how we can move around the city much more dynamically and make better use of the space we have available. However, the devil is in the detail - people on bikes will be watching TfL and the Mayor's new cycling czar carefully to make sure today's proposals are delivered in a timely fashion and to the highest detail. But all-in-all this is a victorious day for cycle campaigners - during his first term we put the Mayor and his office under enormous pressure, and rightfully so. Against the unique background of cycling becoming more dangerous in London the more people who did it, the calls and cries for sweeping action were loud and united in their cohesion. 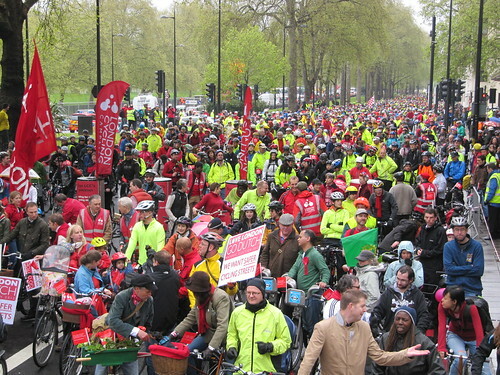 Many of you have taken part in flashrides, bike protests, letter writing campaigns, signed petitions and helped to spread the word, and that pressure is what has helped to lead to today. Boris is "the cycling Mayor" and at times that entire relationship looked likely to turn sour and do him more harm than good. His ambition for all things bicycle has never been under question, but his commitment to real change and to detail was. To his credit, he's gone away and thought about his proposals, listened to all of your voices and come back with a proposal delivering exactly what cycle campaigners have been asking for: world class cycling infrastructure, world class streets, more and safer cycling and the opportunity for many more people to ride a bike safely. Today, Boris sets out how he will deliver on his election promises that you all helped to bring about. As my blogging partner in crime, Danny Williams from Cyclists In the City writes; "I have never seen a commitment to cycling as ambitious as this in this country. I’ve read countless plans by councils and by other cities and I’m familiar with the strategies adopted in other countries. Boris isn’t promising to bring Copenhagen or Amsterdam to London. But he is promising to bring about a better London. And I think that’s the right thing to do.. ...And cycling is going to have to be part of that. A very significant part." We persistently badgered Boris in the run up to his re-election and now he is delivering on those promises. Whilst it remains to be seen how much can be delivered and to how high a quality, the commitment on show today makes it a hugely exciting one. There will be some within the cycling fraternity - a vocal minority - who will turn up their noses at such outright segregation of cyclists on main roads, sneering from the sidelines about their right to use the road without actually bothering to roll up their sleeves and get involved in the dirty work of making our cities safe for all. Boris will today categorically state "nothing I do will affect cyclists' freedom to use any road they choose." By all means, contribute to the undoubted volumes of work ahead in ensuring that all these proposals are delivered to the highest quality, but for those who have strange and dogmatic idealistic ideas about how cars and bicycles should always mix, at all times, and in all circumstances; please keep those thoughts to yourselves whilst we get on with making London a world-class cycling city, where an 8 to an 80 year old can ride safely. 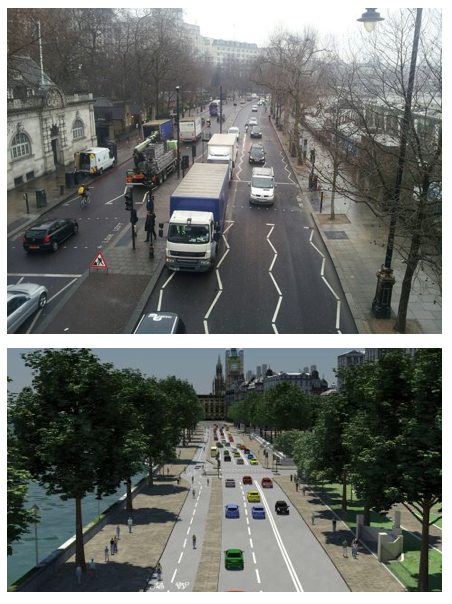 There's a lot of work to do, and a lot of detail to be thrashed out, but for now cycle campaigners can allow themselves a pat on the back at a rare and significant victory, and begin to dare to dream again about what our future London might look like. Well done to everyone who has campaigned for this, you should be proud. As the Evening Standard said yesterday, we need to thank you, and the other top cycling bloggers, for this important document. I should imagine that by the time of implementation it will be some half baked, watered down version that actually makes cyclists less safe. I really, really, really hope this approach ends up in outer-London as I will get to design something ground-breaking and use it! Looking forward to the idea along the Thames - my 9 year old could use it! The Cycle Superhighways sounded amazing when they were first proposed. The reality was somewhat underwhelming. Simon, the Cycle Superhighways never sounded amazing when they were first proposed. The slightest examination of the original proposals showed they were half-baked. This really does appear different. But we'll remain sceptical until we see it on the ground, and people on bikes from one end of society to the other using it. @Neil I agree it is essential to sell the economic case for investment in cycling as being not just about cyclists - many of the benefits to wider society are well documented and cycle campaigners should be ready to dazzle with statistics to shout down any tabloidesque prejudices concerning these kind of schemes. @DavidArditti / Simon I agree with David. Whilst of course we must remain vigilante and ensure pressure is maintained to insit that these plans are delivered the highest of standards, if you read the full report then this really is a step-change in terms of change in rhetoric. It says things like "we either do it well, or not at all - no half arsed measures". I'm cautious, but excited. I agree with most everyone that a corner has been turned, that the development of the cycling environment is now heading in an exciting, new direction, and that over the next three years, significant changes to the streetscape will take place. This is magnificent news, and no mistake. The Mayor’s flagship scheme is a real jaw-dropper. What a fantastic difference this is likely to make! Tantalisingly, no clue is given as to the route between Hyde Park Corner and Victoria Embankment. There are two options. The most direct route goes via Constitution Hill / Birdcage Walk, and the most meaningful route goes via Grosvenor Place / Victoria Street. Either way, cyclists would need to get across Parliament Square, so the prospect of segregated cycling through this junction is very encouraging. Mark, I guess you were quoting from memory, because the actual sentence from the strategy document reads: “Timid, half-hearted improvements are out – we will do things at least adequately, or not at all” – where, presumably, inadequate provision obliges cyclists to behave 'badly'. For me the important thing – the most important thing – is the establishment of a comprehensive, city-wide cycle network, and it is great to hear that this will be made to work within three years. Coupled with the more highly-engineered schemes, there is much to be optimistic about. Even so, I cannot hide my sadness at the proposed signing strategy. Assuming the proposed network(s) would have a reasonable density, there are going to be problems using a combination of names, colours (one per route) and numbers. Besides, there is a simpler, more intuitively useful, and probably even more elegant solution also available, and that would be to use compass colours. Given that this concept was awarded a prize from Innovation in Geography, I need to try to understand why this option has not even been considered. My sense is that my position as an outsider – outside of both officialdom and campaign groups – hasn’t helped, but if this is to be the decisive factor, maybe even the only reason, that would truly be very tough for me to have to accept. Thanks everyone for your comments. As they say in Opera "It's not over till the fat lady sings" and as my post points out the devil really will be in getting the detail delivered. But all in all I believe there is much to be excited about here. Certainly, enough for me to want to be involved in cycle campaigning for some time yet. It's nice to know one isn't pushing for an entirely hopeless cause! A phenomenal event for the cyclists! Hopefully, the mayor's plans will push through.